With our release of the Snapper Tornado, we wanted to give our fans a chance to win one! 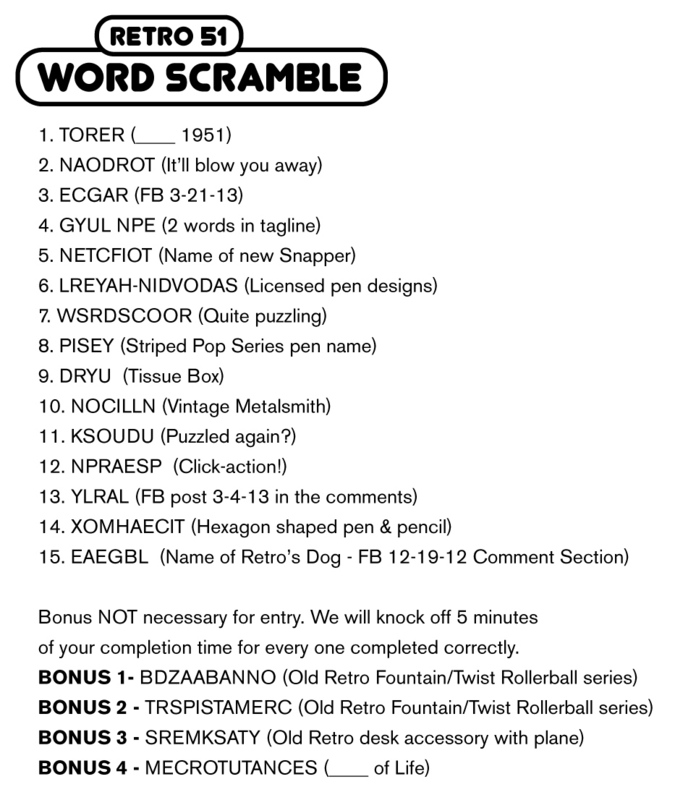 What better way than an old fashioned word scramble of Retro trivia. If you don’t know the answers off hand then use the hints in parenthesis to find the answers on retro51.com or on Facebook (FB – on the specified date). The first two puzzles received with correct answers and two by random drawing for puzzles with correct answers. Contest ends this Friday at noon (EST). The winners by drawing will be announced Friday afternoon. 2. Email the answers to richard [at] retro51 [dot] com. 3. All answers must be correct to be entered for a chance to win. 4. The BONUS section is optional, but you will knock off 5 minutes for every correct answer. IE The email is received at 1 PM, but you got all 4 bonuses so you will get credited for 12:40 PM entry.